Harry Potter and the Half-Blood Prince has been confirmed as the best-selling book of 2005 in the US. JK Rowling's sixth outing of the series sold 7.2m copies throughout the year, while its first day's sales of 4.1m outstripped other books' yearly totals. A Million Little Pieces by James Frey was second in the list after it was chosen for Oprah Winfrey's book club. 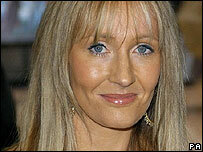 Rowling said last month that she would start work on the seventh and final Potter instalment in January. The writer said on her official website: "I can't quite imagine life without Harry. She added that starting work on the closing chapter of the series would be contemplated "with mingled feelings of excitement and dread". The Half-Blood Prince was published in July and went on to become a worldwide best-seller. More than 300 million copies of the books have been sold internationally. Another best-seller to feature on the 2005 list is The Da Vinci Code by Dan Brown. It was originally published in 2003, but still made number five. Brown's earlier novel Angels and Demons was also one of the year's best sellers, featuring at number eight on the chart. The Da Vinci Code has been made into a feature film, starring Tom Hanks and Audrey Tatou, which is expected to be released in May.